After six months of work, my guide about becoming the Chief Financial Officer of your own life is ready for launch! Be Your Own CFO will be released on April 22. Over the next couple of weeks at Get Rich Slowly, I'll share some background on this project, including excerpts and outtakes. Today, for instance, I'll give you a taste of what I've written about the importance of profit. The overall theme of my new guide is that people would have greater success managing their money if they acted as if it belonged to a business. I think most of us understand that companies can't exist without profit. But for some reason, people don't practice this concept in their personal lives — even though the same principle applies! Profit is the life-blood of every business. It's like food and water for the human body. Although proper nutrition isn't the purpose of life, we can't exist without it. Food and water give us the strength we need to pursue the things that bring us happiness and meaning. Similarly, profit isn't the purpose of business, but a company can't survive without it. What's the purpose of business if it's not profit? It varies from company to company. Harley-Davidson says it exists “to fulfill dreams of personal freedom.” Nike wants to “bring innovation and inspiration to every athlete in the world.” Perhaps the most notable example of a company that doesn't put profit first is Apple, which has taken a lot of flak on Wall Street recently because it “has to” release a new product or risk becoming irrelevant. Apple lets the pundits squawk and quietly pursues its purpose. Meanwhile, they continue to make money. Companies that forget (or ignore) the importance of profit often become unable to meet their goals. Instead of pleasing customers or developing new products, they find themselves in a struggle to survive. 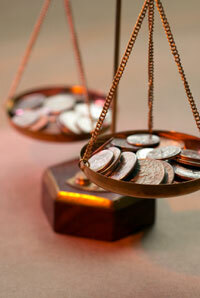 A good Chief Financial Officer aims to maintain and maximize profitability. Individuals need profit too. If you're living paycheck to paycheck — or worse, sinking into debt — you'll find it impossible to accomplish the goals you've set for yourself. Plus, today's profit acts as a safeguard to protect you against an uncertain tomorrow. It also provides flexibility, giving you more options and allowing you to seize more opportunities. What's more, you can invest a profit, growing the money for future needs, such as retirement. The bottom line: To fulfill your dreams, you must earn a profit. Profit is simple to calculate. It's your net income, the difference between your revenue and expenses. If you earned $4,000 last month and spent $3,000, you had a profit of $1,000. But if you earned $4,000 and spent $5,000, you had a loss of $1,000. Since the beginning of this blog, I've called this the fundamental equation of personal finance. If you spend more than you earn, you're operating at a loss; you're losing wealth and in danger of going into debt (or, if you're already in debt, you're digging the hole deeper). If you spend less than you earn, you're producing a profit and building wealth, which can be used to pursue your goals. Your net worth is the accumulation of years of profits and losses. The greater the gap between earning and spending, the faster your net worth grows (or shrinks). This may seem obvious, but it's important. Everything you do — clipping coupons, saving for retirement, asking for a raise — is done in support of this basic idea. You can spend less. A business can increase its profit by slashing overhead: finding new suppliers, renting cheaper office space, laying off employees. You can increase your personal profit by spending less on groceries, cutting cable television, or refinancing your mortgage. You can earn more. To generate more revenue, a business might develop new products or find new ways to market its services. You might earn more for yourself by working overtime, taking a second job, or selling your motorcycle. All financial advice is based on the fact that these are the only two ways to boost your profit. You must spend less or earn more. There are no other options. While it's helpful to track profit as a raw number, it's even more useful to track profit margin, which measures a company's profit as a percentage of its income. For instance, if a business had a profit of $30,000 on $200,000 sales in 2013, the company's profit margin would have been 15 percent. In recent years, the average large American company has had a profit margin of roughly 9 percent. Although they vary by industry — accounting firms tend to have higher profit margins than manufacturing businesses — small businesses generally run margins between 5 and 15 percent. In personal finance, the profit margin is called a saving rate, and it measures the percentage of your income that has been set aside to pursue future goals. The economic definition of saving is “current income minus spending on current needs,” which is essentially the same definition used to calculate profit on an income statement! Unspent money is money saved. It's profit. Profit margin is a vital metric of business success, and saving rate is an important tool for measuring your personal financial progress. It might, in fact, be the most important number in all of personal finance. Saving (profit) over time builds wealth (net worth). Finding your saving rate is simple. For any given period of time, divide your profit (total savings) by your total income. This number, expressed as a percentage, is your saving rate, your profit margin. Note: According to the Organization for Economic Cooperation and Development, the average U.S. household saved 3.9 percent of its household income in 2012. That was better than Denmark (which had a saving rate of -2.3 percent) and Spain (1.9 percent), but worse than Australia (10.3 percent), the U.K. (7.1 percent), and Norway (9.4 percent). Canadians saved 4.0 percent of their income in 2012. When you begin to earn even a small profit, the balance of power shifts in your favor. With a profit, you don't have to worry how to pay your bills. Profit allows you to chip away at the chains of debt. Profit removes the wall of worry and grants you control of your life. How much profit do you need? Most financial advisers urge people to save 10 percent of their income. The bold ones recommend 20 percent. Profit margins like this are small enough to seem achievable yet large enough to allow pursue their goals (albeit slowly). A savvy CFO will treat these recommended profit margins as only the beginning. This table is taken directly from my upcoming Be Your Own CFO guide. Your profit margin affects how quickly you'll achieve your goals. A profit margin of 20 percent will allow you to reach your destination twice as quickly as you would with a profit margin of 10 percent. But if you can save 40 or 60 percent, you'll get there even quicker. The more you save, the more profit you generate, the sooner you can do the things you dream of doing. There are 40 reader responses to "The power of profit margin". In your table, you have “With a 50% profit margin…” and “With a 20% profit margin…” mixed up. Thanks for noticing the table headings are wrong. I can’t fix it, but I’m sure J.D. will and we’ll fix then. You’re right. You’re right. You’re absolutely right. And I can’t fix it. (Well, I can, but it’s going to look goofy.) I noticed this error while proofing the Be Your Own CFO guide and told the designers about it. They’re fixing it. I should have remembered that before sharing it here but I was thinking crazy. I’ll try to come up with a quick patch. I like this approach! I think it speaks to a broad audience It’s not about the feel-good frugal lifestyle, it’s sound business sense. I suspect the next part of the book will be about putting those savings back into the business? (i.e. investing) Curious to read more! Leaving Capital Gains out for now – if you’re not earning an income you’re not paying taxes. Taxes should not be included as an expense when estimating what a year’s income would look like (ie, how much should I save to have a year’s expenses). However, for everything else, taxes should be part of the profit calculation. Unless I’ve missed something, you are technically earning an income when you 1) live on income from investments or 2) withdraw money from a retirement account. Say my current expenses are $1500/month. I’m paying for them with after tax dollars. I would need to save $1500 after tax income to cover a month of not working. The Wealthy Barber Returns has an interesting chapter on how to adjust your retirement plan contributions based on the before tax/after tax divide. FYI the tables have their headings reversed. The 20% profit and 50% profit tables have the wrong heading. JD, great article. I want to show it to my 20-year-old son, who knows everything. However, you might want to double check the table. I think the headings on the middle two are switched. Shouldn’t 20% come before 50%? I think the tables themselves are ok, but the headings are in the wrong places. Just sayin’. I work to keep my profit margin above 50%. I absolutely plan on making changes to increase that percentage as well, by working on both sides of the equation, income AND spending. I think in many ways this is too simple. The idea of profit requires an understanding not only of the balance of income and expenses, but the difference between expenses and cash flow. Many businesses decrease their expenses by increasing their investment. That is they increase their net outflow of cash in order to increase their net profit. The same is true for most of us. For instance, when we buy a house we spend a lot more money than we take in. But between appreciation in value and the impact of inflation on rents, we come out ahead in the long run. Not to mention the other benefits of owning a home. But buying a home requires you have the cash flow to support your mortgage. This may be obvious with the home purchase. But it becomes a bigger issue with things like new energy efficient appliances, insulation and windows. These things will pay for themselves in the long run, but they result in immediate hits to cash flow. In broader terms, you can point to all sorts of investments that pay for themselves in the long run that are better uses of money than adding to “savings”. College debt is out of control, but for most people it still pays for itself compared to the the alternative of not getting a degree at all. Buy a bike to ride to work and your savings in automobile costs and/or transit will more than pay for it. Not to mention avoiding that health club membership you need to get exercise. Frankly focusing on profit is just another side of the problem that gets people into debt. An obsession with money and what it will buy. Chasing after enough money to buy everything you want is just chasing your tail. As long as having enough money is the goal, the goal posts will keep moving to be just out of reach. Ross, you have some valid points. I chose not to focus on cash flow for this course and guide because every time I’ve brought up the subject in the past at Get Rich Slowly, it’s confused people. I need to find a way to simplify it. Besides, if you focus on boosting profit, that’ll boost your cash flow. Your final point is valid, which is why I argue that profit is not the purpose of business or your personal life. In fact, the first part of the guide is about developing a mission statement, and from there a personal “business plan” that guides your decisions. This mission and this business plan are the goals, not the money. The money, as I said, is like food and water to keep you sustained as you strive to achieve your actual goals. Does that make sense? Not necessarily. In fact often that is not the case. For instance, if you own a home or a rental property you could very well be making a “profit” while having a negative cash flow. If you are investing in home improvements, the same situation can occur. I don’t think cash flow is confusing. Most people budget on cash flow. They think if they have a positive cash flow they are making money. What is confusing, I think, is profit. Most people treat their credit card, mortgage and car payments as expenses. They treat their savings as a profit even when their debts have increased by more than their savings. In truth, most people get ahead by spending money wisely, not by saving it. There should be a lot more focus on how money is spent rather than how much money is spent. While that is not necessarily true, it is definitely true in MOST cases. Unless you invest a lot more in resources to boost your profit you are going to come out ahead – I.E. If you pick up a weekend job that only results in $20 more gas but you earn $300 dollars that definitely increases cash flow. I don’t think most people think this way. Almost everyone I know treats their house as an investment, their car as a liability, and their credit card debt as either a liability or expenses (if you use it to buy budgeted expenses anyways). Great post, the concept of saving 50% and working for one year and taking the next off was one of the biggest, most mind blowing ideas I got from Early Retirement Extreme that I felt was missing from GRS and IWTYTBR. And it actually goes even further, because you’re earning interest on your savings and your expenses go down when not working (no work clothes, gas to drive to work, eating out because you don’t have time to cook, etc). I agree with the concept 95%. The one major difference between businesses and people though, is that for most businesses their goal is to grow profit every year. There’s no ceiling until the company sells or fails. Most people are either happy maintaining the same level of profit, even reducing profit in some instances and stages in life. You are starting with the basic premise that everyone believes a corporation should make a profit. I was reminded of an interesting video made by Peter Schiff at the DNC in 2012. He finds a number of delegates that believe we should ban corporate profits. Perhaps we should also ban individuals from making more money than they really need to live. The fallacy of this type of thinking is “who” determines what individuals “really need to live”. Look at Cuba and North Korea. While the average citizen live in near poverty while the ruling class is living large. You actually don’t even have to go outside of the U.S. to see this. Just look at our politicians (regardless of party). They make exorbitant amount of money while in office, dictate to the minions what they can and can’t do, yet exempt themselves from many of the laws they pass. That is not the country I want to live in. Banning corporate profits only works in a Utopian society where people are motivated solely based on intrinsic rewards of happiness, kindness, and the desire to advance society. We wouldn’t have advanced computers, iPhones/Androids, many foods we enjoy, or many other things without corporate profits. Not saying they shouldn’t look at ways to increase the intrinsic motivations and lessen the reliance on profits to move forward innovation and success…but banning profits would end poorly in the long run. I wouldn’t be working right now if I didn’t get some type of personal profit, even though I enjoy helping people out. I really like the idea of the table. It illustrates the concept quite well. Personal finance in a nutshell. Even if you don’t increase your income, decreasing your expenses and saving that money has a real powerful effect. Can’t wait for the book! At 20%, I would need to save for 96 years to save up 24 years of expenses? That’s incredibly depressing. No wonder so many people can’t afford to retire. Yes, Vanessa. This. This is what Mr. Money Mustache calls the shockingly simple math of early retirement. In fact, talking with him in Ecuador last year is what made me realize how important a high saving rate (or profit margin) really is. Of course, there are other factors to consider, such as compounding over time, but the reality of the situation is that the greater your profit, the sooner you can stop working for somebody else in order to pursue the things you really want to do. It’s a shame that more people don’t realize this, and it’s become my mission to get the word out. I recently found the Mr. Money Mustache blog and love it. My journey all started with Dave Ramsey’s teaching, and the idea of saving 50-65% of my after tax income is step 2 on my list after paying down my school loans. I love the idea of treating your finances as a business & CFO. It is very similar to the idea from the Rich Dad materials: You’ve got to treat your life like a business, and you get a head by minding (paying close attention to), your business. My wife and I have had discussions about this; one of the hurdles she is working through is the idea that treating her life like a business seems somehow callous, or uncaring. This has led to many intriguing discussions about the nature of business, ethics, mission statements etc. She is coming around, and as she does, she is beginning her own business venture as a side gig! So yes, I’m totally onboard w/managing personal finances with efficiency, and seeking to maximize profits. I love the table, by the way. I definitely need to look at it regularly to stay motivated. Which, frankly, only goes to show that it’s ridiculous and unrealistic to expect people to save enough for retirement on their own. Either we agree that supporting people when they’re old is important and make the collective effort, or we agree that we just don’t care, as a society. Congratulations on completing the guide! This is powerful stuff that really makes me think…. However, there’s a difference in how profits should be treated– companies can pay a dividend/distributions to owners, reinvest the profit into the company, buy back stock, etc. An individual shouldn’t treat profits that way. Hence, for individuals, “investing in yourself” (e.g. education) is best done earlier in life when there is a large potential for returns, whereas later in life the income generation needs to be outsourced. On the other hand, a 150-year-old business can put its profits into R&D or capital assets and expect decades of returns. Of course this could have been different in places/times when large families lived and worked together– you could reinvest the profit into the younger generation with the expectation they would take care of your needs in old age, and things would go on like that, sort of like an ongoing business. Straightforward article. And being 40 and part of Generation X, tons of us are realizing we may not live as comfortably as our parents because cost of living and stagnant wages (for many) have forced people to delay retirement. As to being a CFO of our lives, it necessitates a more profound and meaningful stewardship of our own money… a mission to financial freedom that tells us to take control of our actions in simple ways. Like the concepts!!! The guide will be released on April 22nd. In fact, I’m working like mad at this very moment to complete collateral material. (Well, I’m actually typing this comment, but that’s another story.) The Get Rich Slowly course will include a 52-week email series. I just finished writing the first two emails, and want to have eight more done by the end of the day. Yikes! I love the way you cut to the quick of personal finance and simplified the foundational concepts. Thinking of personal finance from the vantage point of a CFO absolutely makes sense and if everyone did this there would be a lot less troubled domestic balance sheets. Profits sound so much better than net income. It has a more active successful vibe. Something to be proud of! A thoroughly enjoyable read. Being practically a newbie when it comes to personal finances I never really thought about looking at my savings from a business perspective. Being my own CFO has a nice ring to it and I will definitely will start thinking about profits instead of savings from now on. BLAMM!! !, that article was great!!! Like most folks here I CANNOT wait for the book. I am SO glad you are on my fav’s. I will use this to show my wife (whom I love dearly, put down the knife babe..) WHY I feel so strongly on the precepts you, Dave Ramsey and others preach. Thank you GOD for men like JD. I…don’t mean, at all, to be rude. But I don’t understand how this is interesting? All I see is “spend less than you earn” written over and over and over in different words. Just because you don’t understand does not give you license to be rude. And Yes, you were. Expressing that I find something uninteresting, which I was doing in polite, qualified language, is pretty mild. If you found that comment offensive, you must have a hard time reading most online forums. I don’t find that “spend less than you earn” becomes any more interesting when you phrase it as “earn a profit.” I am legitimately interested in hearing why others might. My only issue with the 75% example is that it’s pretty much impossible. Who has expenses of only $12,500 per year? Even if you owned your home outright, you have property taxes (I know, not in every state, but in Texas $600/mo in property taxes is pretty standard), most likely home owners insurance, utilities…oh wait, we still have to buy food, car insurance, put gas in that car, health insurance, get a haircut every now and then, buy some toiletries… dang, life gets really expensive really quickly. Not sure if this has been said but I’m curious to know when you say your ‘income’ do I use the total salary figure (ie $55,000) or do I use the actual take home pay per month after taxes (ie roughly $2,500 a month which is actually $30,000 a year)? What figure do I use? Thanks for this article – it got me thinking! And yes have realized I need to think of my personal finances like a company does and start figuring out how to make a profit!